Craig Qualified from Dundee University in 1998. Since then he has gained valuable experience working in well respected private practices in Scotland, Australia and more recently here in Northern Ireland. He is committed to offering quality family care to the highest possible standards and has a keen interest in modern cosmetic techniques. Craig ensures his knowledge and skill are kept up to date through regular postgraduate education to ensure his patients receive the options and standard of care they deserve. He is an experienced Cerec 3D user having worked with the system for several years and is delighted to be able to offer his patients these natural, strong, tooth coloured porcelain restorations in a single visit. Craig is a certified in both the Inman aligner and powerprox adult cosmetic orthodontic systems. Craig lives in the Lisburn area with his wife and two young daughters and with a love of the ocean and the mountains enjoys many sporting activities which allow him time in these environments. 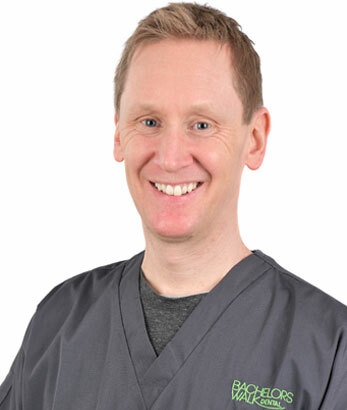 Craig's relaxed and friendly approach to dentistry helps to ensure your visit to the practice is a pleasant one.